What it lacks in flash, moss makes up for in ecological purpose and function. Moss even has applications in the commercial world. Mosses are bryophytes, or small plants that don’t develop the vascular structure, such as xylem, that other plants have. Bryophytes grow in colonies adjoining each other, creating a lush, green plant carpet that can cover entire tree trunks and branches. You’ve probably heard myths about moss, starting with the legend that the plants grow only on the north sides of trees. Mosses flourish on any shady or damp side of a tree, regardless of direction of exposure. Mosses love moisture, and a tree’s northern face, with its limited sunlight, is likeliest to stay damp. That means mosses prefer north-facing tree sides. However, in consistently dark, damp environments, such as the Pacific Northwest, moss proliferates on every side of a tree. In areas with more sunlight and air circulating around trees, moss’s cousin, the lichen, prevails. In regions with high air pollution, neither bryophyte will grow. In the Southern Hemisphere, moss grows mostly on trees’ south sides, where shade is most prevalent. Moss does not harm anything. The plants actually provide food and homes for insects and small animals. Mosses also offer nesting material for birds. 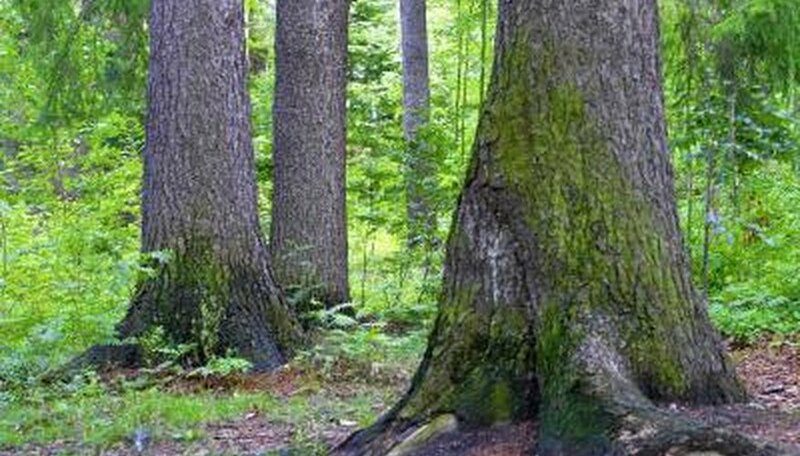 Rich blankets of moss prevent sun damage to trunks and make it tough for wood-boring insects to invade trees. Decomposing moss also adds fertilizing organic material to the earth below the tree. Because they’re intolerant of dirty air, mosses and lichens serve as indicator species that signal pollution troubles. Also, distressed trees, especially fruit and azalea trees, are likelier to see moss than healthier trees, so sudden moss growth could alert tree owners to early tree problems. Though moss is mostly harmless, it can become a concern in large colonies. Because moss constantly absorbs moisture, it can add weight to a tree’s trunk and make the tree vulnerable to blowing over in heavy winds. Thick moss lining tree branches can also bring down the branches, hurting the tree and anyone standing or sitting under it. Several treatments can help if moss is affecting a tree’s sturdiness. For immediate control, peel off the moss, which should come off of the tree in one sheet. Power wash the tree to remove moss. Use these methods only in the winter when trees or shrubs are dormant with no new growth to damage. Moss removed by hand or power washing will grow back. For permanent control, prune surrounding vegetation to expose more of the tree to direct sunlight and air. Also, chemical controls, including copper sulfate or lime sulfur, can control moss growth long-term. The two compounds are toxic, though, and can corrode nearby painted surfaces and cause health problems such as permanent eye damage. Consider hiring a professional tree-care company to apply either herbicide. When air-dried, moss has a number of practical applications. It’s used as packing material to protect fragile objects during shipping, as decorative mulch for potted plants and as a soft, absorbent backing for cradleboards. Craft-store chains sell dried moss for use in preserved flower and plant arrangements. Oregon State University: Physical Control of Moss on Trees and Shrubs?